When I take photographs I am often surprised by the images. I always feel like I am opening presents. 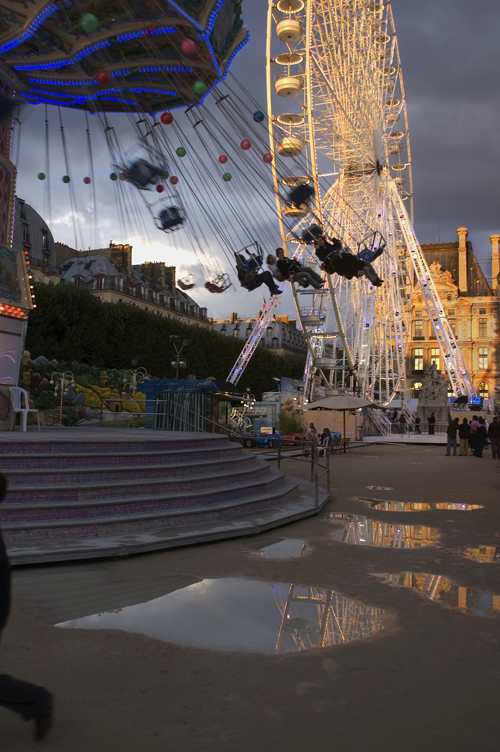 Many of my current photographs are of a small carnival that comes every summer to the Tuileries Garden in Paris. Its magical quality derives, illness in part, discount from its small size and the lack of loud music and large metal barriers. It is easy there to feel like a child again. I remember the excitement that occurs with the prospect of rides, staying out after dark, and eating cotton candy. I have found that the hour when dusk is turning into night is the best time to photogragh: the transition of pedestrian daylight to the magic of a carnival night. At twilight, the glittering rides and the fading light of the sky create a wonderful space of competing colors. Being a photographer, I am a spectator in an amusement park no matter where I find myself. Of course, in a real carnival things are condensed: lights, emotions and unrelated people together watching rides in amazement. Amid the crowds I see the isolation of people who work the concessions and rides and, others who seem completely alone in the crowd. People come for diversion, a short escape from everyday lives. It is possible here to be amused, frightened, bored, and thrilled. Wanting to explore carnivals closer to home, I have photographed at Old South Beach and York Kingdom in Maine where there is less illumination from rides, more light from floodlights, louder noise and bigger barriers. The crowds here are more homogeneous and the people larger. The unifying element is that everywhere people are looking for fun, watching, playing, riding, and eating.